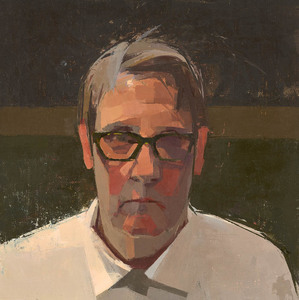 After spending time with Catherine Kehoe’s self-portraits, I carry with me a way of seeing that is so engaged, so aware of design and pattern, shape and color, that I feel I might never be bored again. Waiting in line at the grocery store or in the dentist’s office, I need only to look at any face in front of me and I can begin to see it as a Catherine Kehoe painting, broken down into its elements which are constantly interacting with each other, vibrating against each other. This “realm of infinite possibility” is especially striking in Kehoe’s self-portraits. They bring us into two spheres simultaneously—the terrain of the human face with all its depth of thought and feeling and life experience and the territory of color and space, “free of the limiting labels.” As these two sensibilities meet each other, there is a continual, fascinating exchange between them. Catherine Kehoe photographs her paintings as she works and I had the special privilege of viewing not only the finished piece, but also slides of the stages as the painting progressed. Kehoe’s process of describing a face, most often her own face, beginning with line drawing and then moving into paint, seems to me a paradox of building up and breaking down, both adding complexity and detail and simultaneously simplifying into the essential. As a poet, I naturally think about the making of these paintings in relationship to the making of poems. Allen Ginsberg said, “Write your mind,” and seeing these poems as they develop I feel I am afforded a view into the painter painting her mind. In SP Profile, for example, in the first stages Kehoe has painted a bright pink background brushed with white. Then, as the face evolves, the white recedes and a gray border is introduced to frame two sides of the canvas. Finally, the gray lightens to white and “asks” to take over the background with the angled border shifting to taupe. All pink gone! This feels to me very much like the way a poem sometimes comes into being. I can imagine that pink as a scaffolding that made it possible for Kehoe to build the painting. It gave her something to stand on, so to speak. Something that was necessary for her to do the work. And then, at a certain point, she saw that it was no longer what the painting wanted and it could be omitted the way a word of line or stanza in a poem is no longer necessary and can be deleted. In a painting, of course, something is in every space, even if it’s the raw canvas itself, whereas in a poem, the work may just become shorter. But because the pink was superceded by white—which is akin to a kind of absence--it’s as though the pink was excess and could leave the painting. Although I’ve focused only on the background of this painting, this process of adding in and taking away can be seen in all aspects of the paintings we have the extraordinary privilege of watching progress. Kehoe is continually dismantling the complexity of the human face into its elements. At first glance this seems like a simplification into planes of color, but it is simultaneously a multitude of brush strokes, overlapping, highlighting, interacting, in ways both opaque and transparent, creating texture, pattern, light, shadow, and all the other uncountable subtle variations. So that, in the final painting, we are given, both a stripped down and a highly nuanced view of the person. This is the transformation that Kehoe’s paintings achieve. The intensely intimate gaze she offers us is fearless, naked, almost neutral, so that there’s nothing—not even an emotion—separating her from us. SP in White Shirt. Why can I look at this painting for so long without tiring of it? Why is it like looking at a tree where the breeze is always shifting the leaves just a little. Or the ocean with small waves rising, cresting, breaking, and receding? The picture is static. But it’s not static. The colors and shapes are alive and moving in their relationship to each other. The light strokes on the forehead and the nose are talking to the dark orange planes of the cheeks and they are talking to the grayish brown cheeks, the jaw, the neck and the deep brown vat of the collar from which the head seems to emerge like a living plant might grow from the ground. The grayish-blue streaks in the hair talk to the gray above the eye and the lime green highlights of the glasses seem to say, I am here because I am here, because the light has found me and made me visible. With its one eye looking so directly at us and the other eye shaded, it’s as though this woman is looking both out at us and inward at herself. Which of course she is. This is a face, the painting says. This is my face. And as soon as it says, my face, it also says, your face. We are human, this face says to me. We are the human animal. As I watch this face, I can almost see it breathe. And it’s so patient. So willing to have me look at it. This face reminds me of Marina Abramovic, the performance artist who sat in a chair at the Museum of Modern Art all day every day for over two months. She took her place before MoMA opened and stayed until after it closed, sitting without moving, eating or drinking, stretching or scratching an itch. There was a chair set facing her and anyone could sit in there, on a first come basis, for as long as they liked while she looked back at them. Some stayed for just a few moments; some for a day even though there were long lines of people waiting for a turn. Some cried. Some must have fallen in love. One proposed marriage. How starved many of us are for this unmediated connection. The face in Self-Portrait in White Shirt says, I know. This face says I live in the same world you live in. How does Catherine Kehoe communicate this? I am not capable of fully answering that question, but I believe one of the elements that makes this possible is her ability to compress the way a poem is compressed. Chekhov said that talent is the ability to distinguish the essential from the inessential. Here, as in a good poem, we are given what is essential. Uncluttered by details that don’t earn their keep, free of everything that might distract us, we see the human face honestly, a realness we authenticate from our own experience. After spending a long time with this self-portrait, I went back and looked at the stages it passed through as Kehoe painted it. My first reaction was a kind of disequilibrium, almost a mild fear. The face that I had become so intimate with as I’d studied the finished portrait had changed. Of course, intellectually, I knew it hadn’t exactly changed. It was always in the process of becoming itself, like an embryo growing into the animal it was destined to become. But my emotional experience was disconcerting. Put bluntly, I didn’t trust these earlier faces. They were not reliable, as the final face is. They were unsure of themselves and unsure of me. When I was a child my parents went on a vacation. There was a painter who worked at the resort they stayed at, painting portraits of the guests, and he painted a picture of my mother. Because he wasn’t a very good painter, the painting looked like my mother and not like my mother. It was eerie, unsettling, for me as a child to see someone so like my mother, but not her. I had a similar feeling looking at the stages of this painting by Catherine Kehoe. But Self-Portrait in White Shirt is a face that we believe in. 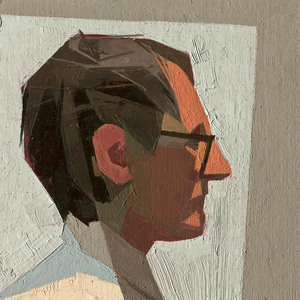 This is a face that is willing to be seen—that the painter is willing to work to have us see. Not only the work of this individual painting, but all the years required to develop the skills, all the previous paintings that led to this one. I want to show you a true face, this face says. As Mark Doty writes, “Beauty is not loveliness grace, or pleasurable sights, though any of those might certainly be part of it. For the writer out to evoke the texture of experience, beauty is simply accuracy, to come as close as we can to what seems to be the real.” This is what Catherine Kehoe has achieved in her arresting self-portraits.